Gingerbread for Liberty! has the word gingerbread in the title. I'll admit, that's all it took for me to click over to my local library webpage and place a hold. I love food (like a lot of you do, I imagine). I love books only slightly less than food (and some days it's pretty even in the running). A book that combines food AND art AND history is just extra icing on the gingerbread. Lucky me (and you), this one met my (admittedly high) expectations. Christopher Ludwick was a German-born American patriot with a big heart and a talent for baking. When cries of “Revolution!” began, Christopher was determined to help General George Washington and his hungry troops. Not with muskets or cannons, but with gingerbread! 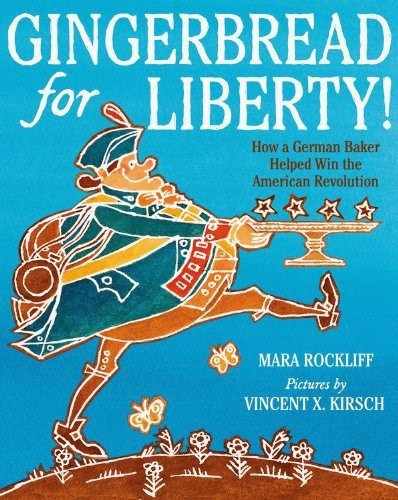 Cheerfully told by Mara Rockliff and brought to life by Vincent Kirsch’s inventive cut-paper illustrations, Gingerbread for Liberty! is the story of an unsung hero of the Revolutionary War who changed the course of history one loaf at a time. Gingerbread for Liberty! : How a German Baker Helped Win the American Revolution is a picture book that delves into the history of German-American baker Christopher Ludwick, who lived in Philadelphia during the Revolutionary War period. This little-known character was famous for baking gingerbread for the city, volunteering to help feed Washington's army, and he rounded it out by going on special night missions to convince German troops to switch sides and fight for an independent American nation. While Rockliff does a good job with the story and history, the best part by far is Vincent X. Kirsch’s art and overall book design. The interior art is made up of layered paper cut outs in primary colors, with white edging that mimics traditional gingerbread decoration. The font matches the unique style, though at times its placement is not always intuitive for the reader. The effect, once you take in a page spread or two, is charming and the tiniest bit old-fashioned, like the wooden lace scrollwork on an old Victorian house. It doesn't ever edge into cutesy, though, and the various cityscapes, ships, soldiers and exploits described throughout the book will appeal even to those who have no interest in gingerbread. That's said, if you are interested in food + books like I am, this book is perfect. The endpapers contain a gingerbread recipe (presumably like the one Ludwick would have used), and I was sorely tempted to bake and decorate in shapes to match the book's many illustrations. I can see this book spawning family or classroom culinary adventures, especially around the Presidents' and Independence Day holidays. In all, Gingerbread for Liberty! is a multi-interest picture book that expounds on a little-known figure in American history, with fantastic art and a baking hook. Recommended for: parents and teachers looking for children's books that focus on history (with a lesson but without tedium), anyone who enjoys baking, and fans of paper crafts/art. I like gingerbread so this sounds like a fun book to read with the kiddies. I love books that introduce use to little know personalities from history. I may just have to get this one myself. Sounds like this one would be fun to read and then bake. Yum! Love that a baker could be an unsung hero! I'll admit I was sad when I clicked over and this wasn't a recipe for gingerbread from you! How fun is this book? And (as you can probably guess) I love ginger. I think I'm going to have to check this one out of the library.